The famous Muslim Snack Street in Xi An, China. BEIJING — The Chinese characters for “pure” and “true,” signifying “halal,” hang over numerous restaurants across China, a symbol of a commitment to prepare food in accordance with Islamic law, including its ban on pork and alcohol. 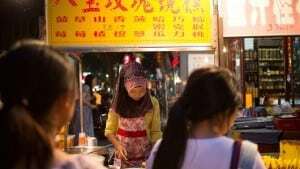 But some of China’s more than 23 million Muslims worry that businesses routinely flout those guidelines, selling sweets laced with lard, for instance, or pork disguised as beef. As political leaders gathered in Beijing for the annual session of the Chinese People’s Political Consultative Conference, a government advisory body, officials once again raised the idea of imposing national standards on halal food, which have been under consideration since 2002. Ma Guoquan, a delegate from Ningxia, a region in northwest China that is home to a large Muslim population, said it was important to respect the traditions of ethnic minorities and to promote the unity of Chinese society. “There are many problems regarding halal food management that can’t be ignored,” Mr. Ma said at a meeting in Beijing last week, according to a report in Ningxia Daily, a state-run newspaper. Many local governments in China, including Ningxia and Shanghai, have put in place rules on preparing halal food. Islamic law bans the consumption of pork and alcohol, and it dictates how animals should be slaughtered before they are eaten. But enforcement of those regulations has been lax in some provinces, angering local residents. In Xi’an, an ancient capital in central China, Muslim residents took to the streets last year to protest the sale of alcohol in halal restaurants. In Xining, a city in the western province of Qinghai, a riot erupted last year after residents discovered pork products inside a halal bakery’s delivery van. As the market for halal products booms around the world — some analysts expect it to reach $1.6 trillion in the next several years — Chinese businesses are looking for ways to enter the market. President Xi Jinping has sought new alliances with many predominantly Muslim countries, proposing a “One Belt One Road” initiative to restore Silk Road trade routes. But halal business owners in China face several obstacles to selling their products abroad, including the perception that food in China is unsafe or not prepared in accordance with Islamic law. Islamic leaders said a set of national standards could help promote China’s image abroad.